Barbara Edwards Contemporary is pleased to announce a solo exhibition of works by Canadian/Ukranian artist Taras Polataiko. This exhibition presents selected works, which are indicative of Polataiko’s concern with iconic moments in art history. In returning to the origin of the idea, Polataiko enters a dialogue with his predecessors, that is at once reverent and subversive. Concurrently on exhibition as part of Rearview Mirror at The Power Plant, the Glare Series (1995) revisits Kazimir Malevich’s geometric abstractions, albeit in the form of deftly painted glossy textbook pages. In his writings, Malevich defined the “additional element” as the quality of any new visual environment bringing about a change in perception. For Polataiko growing up in communist Ukraine, access to these images was limited to textbooks and so the artist paints the glare--the added element of his own perception. Polataiko’s celebrated Cuts Series (2001) reconsider Lucio Fontana’s spatialist principals. Where Fontana slashed the painted canvas in an attempt to capture movement through space and time, Polataiko re-paints Fontana’s cut as trompe l’oeil, reinforcing surface and superficiality, an inversion of Fontana’s original intent. In Human Locomotion, models re-enact poses from Eadweard Muybridge’s iconic stop-motion project (1887). While Muybridge used a rapid shutter speed to freeze his subject’s natural motions, Polataiko uses slow and long exposures to capture his models holding unbalanced positions. Through this inversion, Polataiko addresses the conditioning of humanity by technological advances. In his multiples, derived from the installation Light Works, the artist revisits the birth of conceptual art with Marcel Duchamp’s readymades. 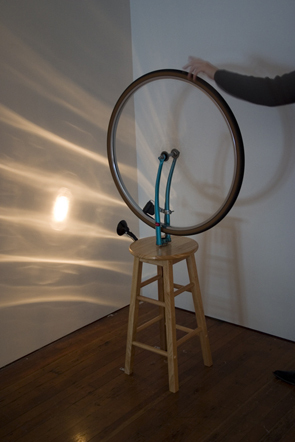 The installation created for the Musée d’Art Contemporain (2005) comprised a collection of light sources; their functioning controlled by ten individuals on bicycles peddling as compensation for minor offences. The conceptual working drawing and the readymade included in this exhibition present a contemporary take on Duchamp’s concept that the “creative act is not performed by the artist alone”, but rather involves the spectator’s participation and interpretation as integral to the work. Polataiko was born in 1966 in Chernivtsi, Ukraine. He studied painting, art history, and philosophy at the Moscow State Stroganov University of Fine and Industrial Arts, moving to Canada in 1989 to pursue a Master of Fine Arts at the University of Saskatchewan. Polataiko’s public exhibitions include Ukrainian Institute of America (New York); Künstlerhaus Schloß Balmoral (Frankfurt, Germany); Center for Contemporary Art (Warsaw, Poland); Soros International Center for Contemporary Art (Kyiv, Ukraine); Art Gallery of Hamilton; Museum of Contemporary Canadian Art; Musée d’Art Contemporain; Winnipeg Art Gallery; Museum London; MacMaster Art Gallery; Artspeak Gallery; Art Gallery of Greater Victoria; MacKenzie Art Gallery; Dunlop Art Gallery; Mendel Art Gallery (all Canada); Antoni Tapies Foundation (Barcelona, Spain); CAAM (Las Palmas, Spain), Artspace (Sydney, Australia); National Museum of Contemporary Art (Belgrade, Serbia) and the National Museum of Art (Lithuania). In 2002 Polataiko represented Ukraine at the 25th São Paulo Biennale and in 2009 he participated in the International Incheon Biennale in South Korea and Volta 5: Age of Anxiety in Basel, Switzerland. He is currently based in Lethbridge.